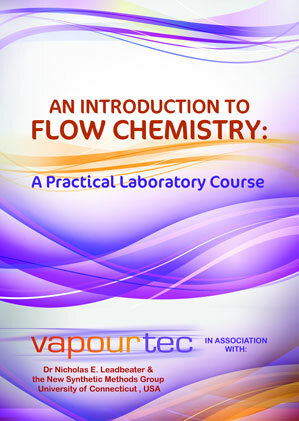 Flow chemistry is also known as continuous flow or plug flow chemistry. It involves a chemical reaction run in a continuous flow stream. The process offers potential for the efficient manufacture of chemical products. Recent breakthroughs using Vapourtec systems are in production of Tamoxifen (Breast Cancer) and Artemisinin (Malaria). Reactants are first pumped into a mixing device. Flow continues through a temperature controlled reactor until the reaction is complete. The reactor can be a simple pipe, tube or complex micro-structured device. 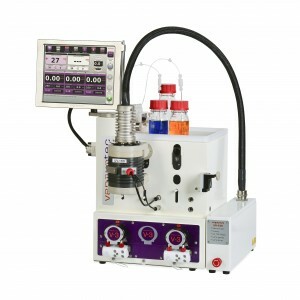 The mixing device and reactor are maintained at the temperature to promote the desired reaction. The reactants may also be exposed to an electrical flux or a photon flux to promote an electrochemical or photochemical reaction. 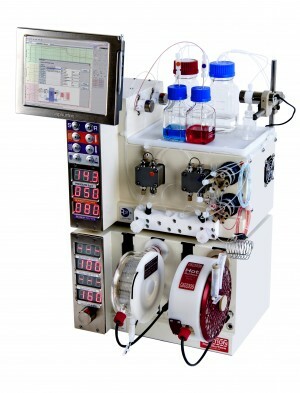 Reaction time is determined by the time the reagents take to flow through the reactor. This period is called the residence time. Reaction stoichiometry is controlled by the relative flow rates of the reactants. The concentration of one reagent relative to another can be increased simply by pumping that reagent at a higher flow rate. Flow reactors have excellent heat transfer when compared with batch reactors. This feature is due to the much greater surface area to volume ratio of flow reactors over batch reactors. Reactors designed for flow chemistry have high rates of mass transfer. This is due to the small sizes and good mixing that is possible. Flow reactions can simply be run for longer. This produces more material. When reactions are run in continuous flow only small quantities of potentially hazardous materials are “in-process”. Reactive intermediates don’t need to be isolated. Flow reactions can be easily run in sequence or “telescoped”. Flow reactors do not require a head space. The pressure within the reactor is controlled by a back pressure regulator (BPR). With high pressure batch reactors the gas within the head space must be pressurised. Click here for examples of chemistry performed in continuous flow. 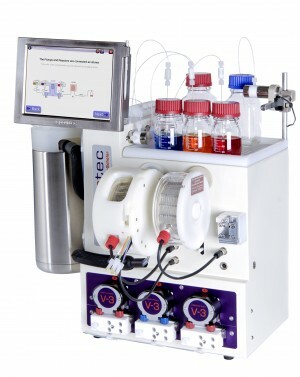 This paper describes several examples of the use of organometallic reagents in a Vapourtec flow chemistry system. These include n-butyllithium, Grignard reagents, and DIBAL-H. Examples are reported over several hours of continuous pumping. Multigram quantities of products are produced. The highlight of the paper is an approach to the telescoped synthesis of (E/Z)-tamoxifen. Organometallic reagent-mediated transformations are used. This paper describes the use of flow chemistry techniques to develop a continuous-flow process. The process converts dihydroartemisinic acid into artemisinin in an inexpensive, scalable process. Artemisinin combination treatments are the first-line drugs in the global fight against Malaria.